Watch and jewellery expert Kurate International comes to TFWA World Exhibition (Green Village, H44) with a refreshed Belle & Beau free standing display unit (FSDU). The unit aims to support the brand’s expansion into airport and ground stores, including cruise ships and ferries. “We’ve developed and grown our business exclusively within the travel retail inflight market, but with the introduction of our brand Belle & Beau last year, we see too many opportunities not to broaden our scope into airport and ground stores,” comments Claire O’Donnell, Key Account Manager, Kurate International. The new FSDU holds 84 SKUS (434 pieces in total) and is divided into four sides, each with a different offering: best sellers, travel retail exclusives, gift ideas and a new range of carded jewellery. Each item ranges in price from £12-£39, with the carded items offered at £15 each or two for £25. 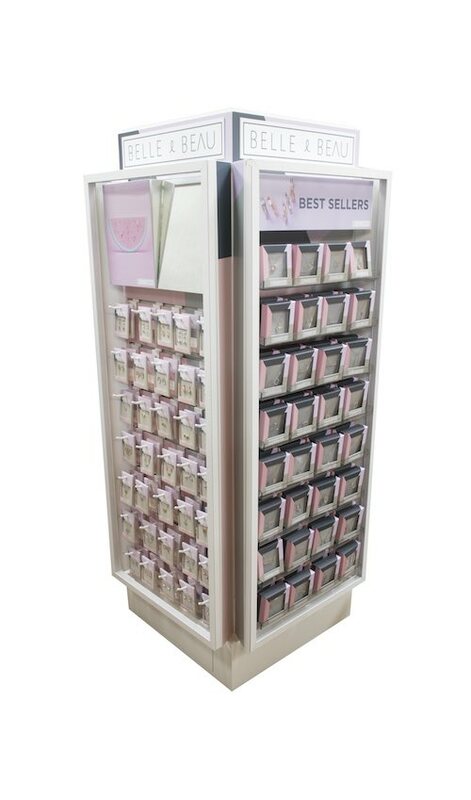 With the option to light up the FSDU and a perspex top to display seasonal offers and promotions, the unit is an eye-catching asset to any ground or airport store. Each unit comes fully stocked and also includes two full re-fills. “The retailer investment for each FSDU is less than £9000, but the total retail value amounts to more than £26,000! That’s a very good deal to any retailer that places one of our units. We are also happy to manage any sales training for the staff, offer incentives for sales and manage the range restock and clearance.” “We are also delighted to announce that we will be working with well-known brand consultant, Liz Woodland, to help us grow our airport and ground stores listings. Liz is synonymous in the travel retail industry, and we are confident that with her outstanding portfolio of contacts we will have a very positive introduction to ground and airport stores,” adds O’Donnell.